Imperium Renewables and the U.S. DOE's Pacific Northwest National Laboratory reported positive results in a joint development for the production of biomass-based drop-in jet fuel in the Pacific Northwest. So far, results are encouraging. 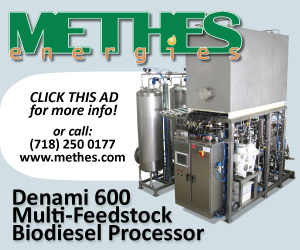 Blue Horizon Bio-Diesel Inc., a wholly-owned subsidiary of Blue Horizon Industries Inc., has been licensed a novel patent-pending technology capable of converting hydrocarbons and low-grade cellulosic material into renewable diesel or biodiesel. The project, titled "Acrylic and Styrenic Monomers and Polymers from Biomass (ACTION project)," is housed under the Biobased Performance Materials Programme at Wageningen University. Milligan Bio-Tech lands funding for plant expansion in Sask. Milligan Bio-Tech Inc. has raised $8 million that will be used toward an expansion project that would increase capacity five-fold to the company's production facility located in Foam Lake, Saskatchewan, Canada. The USDA announced it will make payments to more than 160 biofuel producers in 41 states under the Bioenergy Program for Advanced Biofuels. 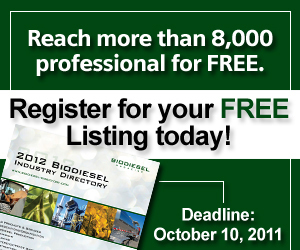 Approximately 90 biodiesel producers nationwide are set to receive payments under the program. An algae photobioreactor developed specifically for laboratory research is set to enter commercial production soon. The equipment was originally designed and developed by researchers at Michigan State University. According to Al Ward, president and COO of Alberta-Pacific Forest Industries Inc., the company plans to repurpose a pulp and paper mill for the production of renewable fuels and chemicals derived from black liquor, a strategy explored since 2008. A group of Colorado-based biotechnology companies, led by BioVantage Resources Inc., have released a suite of bioreactor and open raceway products to accelerate the commercialization process for algal culture growth. The Algal Biomass Organization today announced a special algae technology Finance Symposium as part of the 5th annual Algae Biomass Summit.